TORONTO - His next start won't be against the Blue Jays. Thank goodness. "I'm looking forward to facing somebody other than Joe Inglett leading off the game," Paul Byrd said with a smile after last night's 8-4 Red Sox win over Toronto before 40,181 at Rogers Centre. Sure, Byrd won two of his last three starts, all against the Blue Jays, but he would certainly like to begin preparing for other batters, other challenges. Plus, a few batters were looking a bit too comfortable at the plate last night in an outing Byrd called "six innings of survival." "I'll be excited that maybe Lyle Overbay won't in the lineup and recognize everything that comes out of my hand," Byrd said. Though it wasn't his best outing - beginning with his first walk in 16 1/3 innings, and continuing with home runs to Overbay and Alex Rios - Byrd did enough to get the Red Sox started on the right foot. Add in more offense from a bat that was considered long gone and there were good signs against a team to which the Sox had lost six of their first eight meetings this season. "We've had nights just like this where we've come in here and I'm explaining why we lost or how we lost, and we found a way tonight to turn it around and have a good win," manager Terry Francona said. Part of the reason was the bottom of the order, Jason Varitek not least among them. The last three batters reached base nine times, including four for Varitek, three for Coco Crisp, and two for Alex Cora. They also scored five runs. "We did a good job - the bottom of the lineup today found ways to get on base and set the table for the top of the lineup," Varitek said. "This team has always won with good starting pitching. Had a good starting outing, and we allowed us to get some runs across." Varitek's bat may have been left for dead, but at least on this trip, the 36-year-old catcher is doing his best to impersonate a mighty healthy offensive force. It started in Baltimore with his first lefthanded home run in three months, then another. That marked the first time he had homered in back-to-back games in 11 months. Last night he connected again. Having already reached base in his first two plate appearances (single, walk), Varitek slammed a righthanded homer off reliever Brian Tallet to lead off the sixth. It was his third straight game with a homer, the first time in his career he accomplished the feat. A three-game surge isn't nearly enough to erase the two-month slump that left him batting .218, but it certainly isn't bad, especially if J.D. Drew's herniated disk keeps him out of the lineup. There's no question the Sox could use extra pop. Varitek was doing his job behind the plate, too. Even with Byrd and the Blue Jays way past familiar with one another, the righthander kept the damage to a minimum as he picked up his first Boston win in his second start since the Sox acquired him from the Indians. At least he kept it low enough to earn the victory, even without consistent command or a consistent cutter. "I don't know, it was all over the place," Byrd said. "My cut fastball would sink, run back over the plate, like it did to Overbay. Then it would cut the next time out. I think it was just a little windy. I was just having trouble having a feel for the ball, so I was wild. It was like Boy Scouts: survival. Just trying to make do with what I had." He should know. He did lead his son Colby's Cub Scout troop. The Sox were doing their own damage on offense. 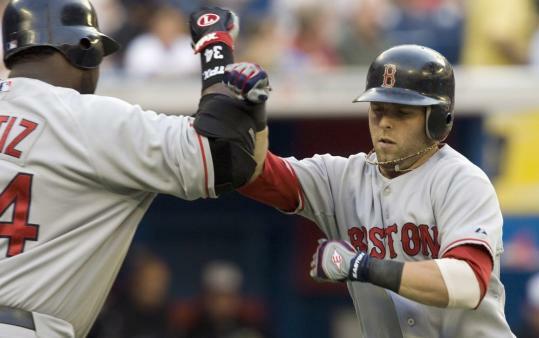 Dustin Pedroia homered for a 1-0 lead in the first, his first hit after 11 fruitless at-bats against starter Shawn Marcum. After Rios's shot put the Blue Jays ahead, 2-1, in the bottom of the first, the Sox went up for good with four in the fourth. They received some help from the opposition. Despite all the praise the Sox heaped upon the Blue Jays' pitching staff after Toronto's humbling two-game sweep last weekend in Boston, this was not a night for compliments. Jason Bay started the fourth with a single up the middle. Then Marcum walked Jed Lowrie and Varitek to load the bases. He hit Cora in the rear to make it a 2-2 game. Crisp followed with a line single to left, scoring another, and the Sox got two more on a ground out by Jacoby Ellsbury and a sacrifice fly by Pedroia. Enough runs to win the game. Enough to give the win to Byrd, even without his best stuff. "Just real excited to be a part of this team," Byrd said. "They play great defense. They hit the ball. I'm having a really good time. I've pitched better, but I'm going to take the win and move on." To face the Yankees, fortunately.